When Trevor Schaefer first learned he had cancer at the age of 13, he knew he would have to be brave and stand up to the disease. Fourteen years after he defeated his own “cancer bully,” Trevor is determined to help all pediatric cancer patients defeat their bully too. Trevor faced medulloblastoma, a highly malignant form of brain cancer. Brain and spinal chord tumors are the second most common cancers after leukemia in children, accounting for an estimated 1 in 4 childhood cancers according to the American Cancer Society. 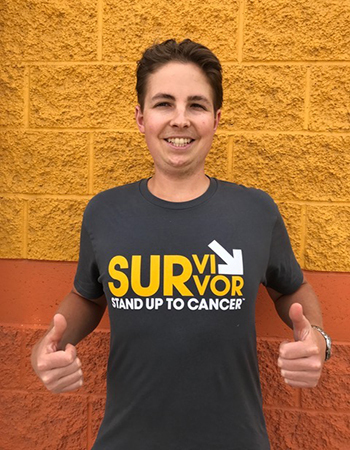 “I lived in a small town with my mom and began experiencing headaches on a daily basis,” Trevor recalls about the time leading up to his cancer diagnosis. “At first, we just attributed the headaches to allergies.” When they became more frequent and so painful that Trevor was often too sick to go to school, his mother knew there was a more serious issue. At his mother’s request, Trevor underwent further testing, and a brain tumor was discovered. “When he was about halfway through treatment, Trevor began noticing just how many children and their families face cancer every day. After accidental injuries, cancer remains the leading cause of death for children under the age of 14. In 2016 alone, an estimated 10,380 children 15 and under were diagnosed with cancer, according to the American Cancer Society. These are the kinds of statistics Trevor became determined to change. Survival rates for childhood cancers continue to rise with treatment advances over the past few decades, such as the recent FDA approval of the new CAR T Cell Therapy supported by research conducted by the SU2C-St. Baldrick’s Foundation Pediatric Dream Team, among others. More than 80% of children with cancer today will survive five years or more. With continued research, Trevor hopes that more non-toxic treatments will become available to allow more childhood cancer patients to become survivors who continue to thrive as adults. Shop the merch Trevor is wearing above (and more) at the SU2C shop.